There’s a totally important new essay by Kathleen Hanna on her blog about what sucked about the ’90s, and how actually young ladies today who romanticize the ’90s (hi, Alix!) shouldn’t feel like they missed out on any super awesome party. It’s Monday at 12 pm. Have you updated your bookmarks? The pretty new blog is here. I was at the MoMA last night for a (packed, super fun) screening of the Le Tigre tour video. In the history of music, there may be more charming band footage than that shot of them in 2004-5 by Carmine Covelli, but I haven’t seen it. The scenes of their band-bus dance-party, workout ritual, and Slipknot photo op are worth way more than the $16 it’s selling for at Oscilloscope. I just pre-ordered three. You can too. Here’s where to get it. And here’s to camouflaged pretzels! That date 12-11-10 reads like a countdown, and I am so counting down the minutes to Kathleen’s tribute show! Here’s the poster. And here’s what she says about it on her blog. 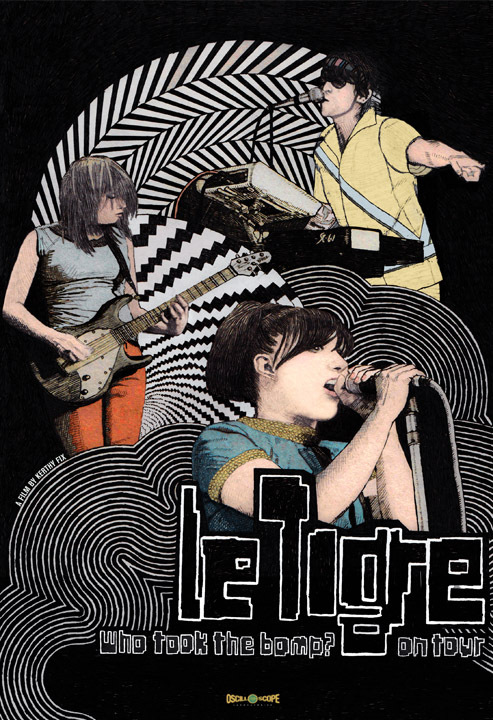 When Neal and I were first dating, we drove cross-country listening to Le Tigre and Julie Ruin. We bonded over our love of Bikini Kill fanzines. Magically, not long after we moved to NYC together, we met Kathleen. Now he’s hosting her show, and I get to go to it. P.S. This is not said enough, maybe because it’s sort of a pre-’90s thing to say, and maybe I should not say it either, but you guys — SHE LOOKS HOT ALL THE TIME. Like, swimming in a lake, or caught in a gusty wind, or babysitting, or after no sleep. She just can not help looking insanely hot no matter what. For real, it’s eerie. The VMAs on Sunday were pretty great, especially the Eminem-Rihanna opening number. But that was not the first sexual assault consciousness raising to go down at the VMAs. Recently on her blog, Kathleen posted a clip of her husband, Adam Horovitz of the Beastie Boys, accepting a VMA in 1999 by rallying the audience to combat violence against women at shows like Woodstock ’99. The speech is really moving and so mind-blowingly brave, especially considering the year and the crowd. This is one of the many amazingly feminist moves by men in the ’90s (check out this gender-studies analysis of Kurt Cobain, for example) that show the impact of ’90s-style feminism on both men and women. I’m sorry, but for such a maligned decade, the ’90s were sort of awesome.